Volkswagen is introducing a second shift at its Transparent Factory in Dresden, doubling the site’s production of the electric e-Golf to meet demand in Europe. Dresden, which had produced the Phaeton luxury car, had been converted to a public showcase for future technologies until it began producing the e-Golf in April this year, on a single shift of 35 cars per day. This second shift will grow that to 70 cars per day, in addition to vehicles produced at the main Golf production line in Wolfsburg. Locally, it follows Volkswagen introducing a scrappage programme for pre-Euro 5 diesel vehicles, which offers up to €10,000 (£8,850) off the purchase price of a new car on top of government incentives. The carmaker said this had quadrupled uptake for electric vehicles, which had accounted for 8% of the 70,000 incentives given out to employees and customers. 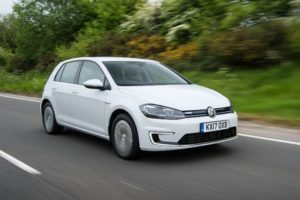 The e-Golf was updated in line with the rest of the Golf line-up earlier this year, gaining a longer range, more power and upgrades to the infotainment system. Although the 4,332 plug-in Golf sales in Germany between January and November 2017 were 60% weighted towards the e-Golf, the GTE plug-in hybrid is by far the bigger seller in the UK.